It’s no secret that I love Ina Garten (or her husband, Jeffrey – who doesn’t?). Nor is it a secret that I love Vermont – just see my newly updated, bound-to-change “About Me” section. It’s enthralling. And if you read my last post, you’ll know that I love the fall. (I don’t mind being a cliché because all of these things are AWESOME.) So what does somebody with my interests choose to make to welcome the new season? 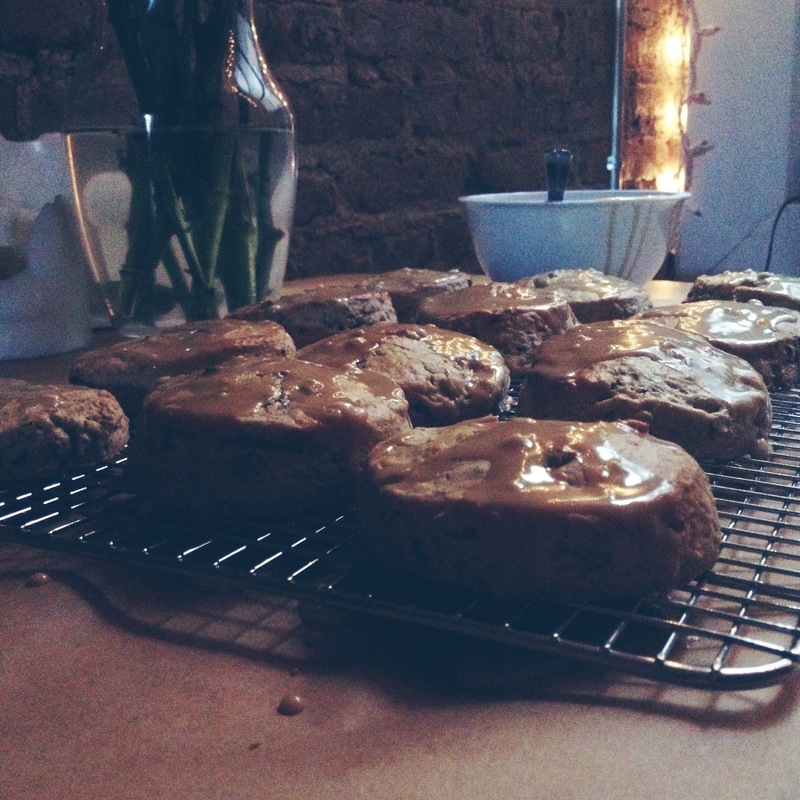 Ina Garten’s Maple Oat Scones, that’s what. Every August, I spend a blissful week in Vermont. It’s hardly enough time spent there, but I’ll take what I can get. This year I came back with a healthy amount of pure Vermont maple syrup, and I’m going to spend the fall using it for desserts, dressings, and glazes for baked goods and savory dishes alike. How did I land on scones, though? I’m actually not sure why I had to make scones. 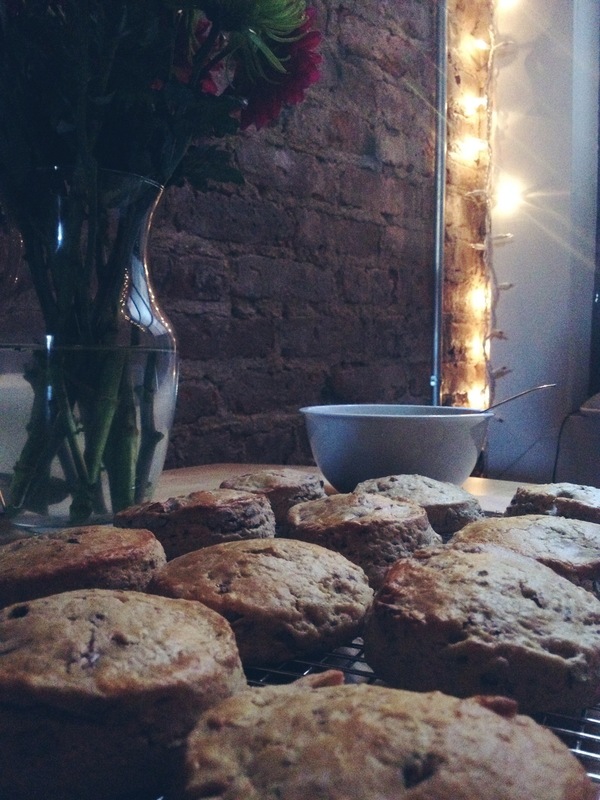 Probably just my British heritage nudging me, saying, “Make scones! They’re cozy and quaint and not muffins! Nobody makes scones, you’re just so special and pretty, Tory.” I can see myself wearing the perfect grey sweater and sitting in a perfectly plush armchair in a cozy little cabin. I look out a rickety window and see full fall foliage, and a swing is swaying back and forth on the tree in the backyard. Rainclouds hang menacingly in an overcast sky, which sits above a currently placid lake. Marlowe the cat is purring nearby, and I’m sipping on spiked cider and munching on this wonderful, crumbly maple oat scone. Isn’t that a romantic image? Isn’t it?!? That’s hard to do in Bushwick though. I would be sitting on my bed (getting crumbs everywhere) without my cat, wearing spandex and looking out my sturdy, metal window at the barbershop across the street. Here’s the point: you don’t have to be in that cabin, wearing that sweater, sitting in that armchair looking at pretty colored leaves to feel the effect of these scones. All you need is a scone and, if you so choose, a hot beverage to wash it down and you’ll still feel warm and fuzzy inside. Just ask the Scot I sit next to at work – he said my “scahn” tasted like home, “except we don’t put this frosting on them in Scotland.” Well, Alastair, welcome to America, where we glaze everything we can. As much as I love and respect Ina and her recipes, I felt this one was missing something – nuts. When it comes to things like quick breads, muffins and such, I generally like nuts to bring some texture and life to it. So what to pair with maple? You might think I chose walnuts. That wouldn’t be a bad thought, but for this batch, I added pecans. Everyone does maple walnut (remember, my vanity British heritage told me I was special and pretty!). Other than that, per usual, Ina’s recipe is flawless. In my last post, I went on a rant about fresh mozzarella. Look at that again, but replace the words “fresh mozzarella” with “VERMONT MAPLE SYRUP”. If you use Mrs. Butterworth in this recipe, we can’t speak anymore. That’s all I’ll say about that. There are four sticks of butter in this recipe. Sorry, folks. That’s just part of making scones and biscuits. The good news is, it only adds up to a little over a tablespoon per scone, which really isn’t all that bad. Share them with your friends – they’ll love you and you’ll be making them fatter. Win-win. 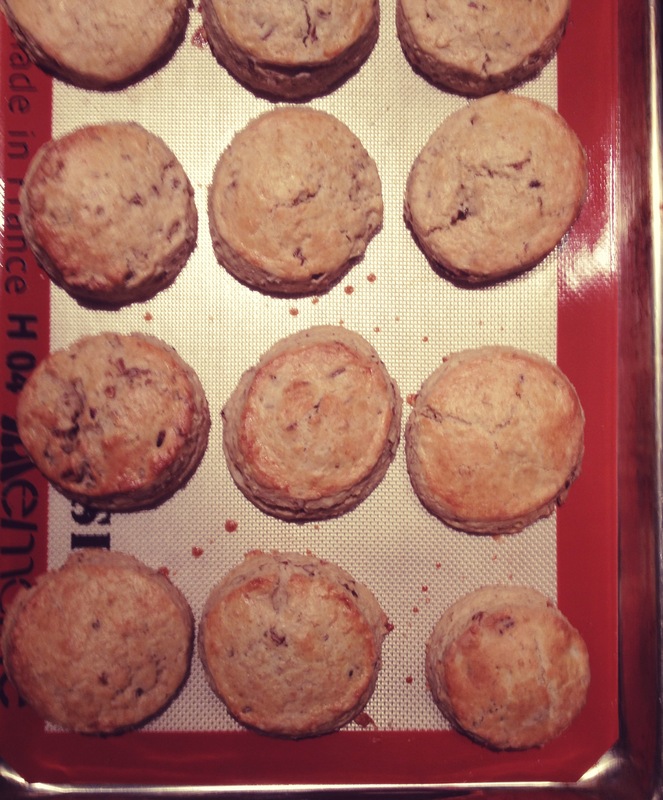 I used a cookie cutter (about 3”) to make uniform looking scones, but you can definitely opt to go rustic. 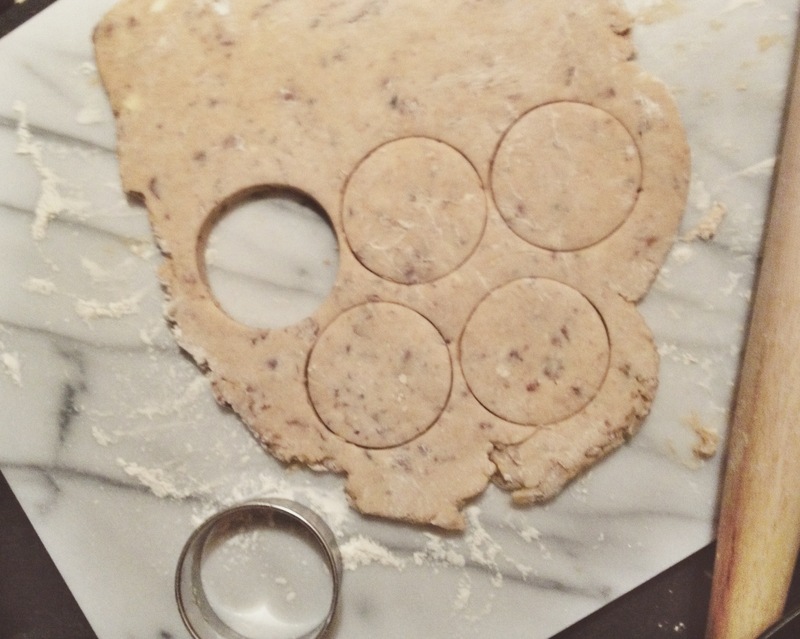 Once you roll the dough out, you can cut the scones into triangles or squares, or whatever you prefer. Just keep them about the same size so they bake evenly. If you’re a maple fan, Ina fan, or fall fan like I am, put on a comfy sweater and get after it! To make the scones: In the bowl of an electric mixer (or you can mix by hand using a wooden spoon) fitted with a paddle attachment, combine both of the flours, oats, baking powder, sugar, and salt. Combine the buttermilk, maple syrup, and eggs and add to the flour-and-butter mixture. Mix just until blended, but don’t overwork. The dough may be sticky. Dump the dough onto a well-flour pastry slab or similar work surface and dust some more flour on top. Flour your hands and a rolling pin as well. 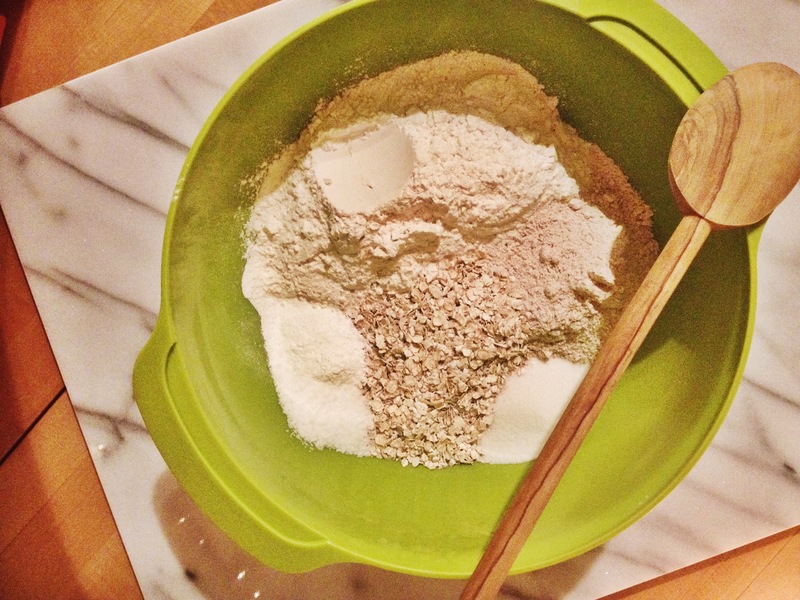 Roll the dough to ¾ to 1” thick. You should see lumps of butter in the dough. Cut the dough into 3” rounds with a plain or fluted cutter and place on a baking sheet lined with parchment or with a Silpat. Bake for 20-25 minutes, until the tops are golden brown. Cool on a rack over parchment or wax paper. To make the glaze: Combine the confectioners’ sugar, maple syrup, and vanilla. After the scones have cooled for at least 5 minutes, drizzle each one with about a tablespoon on the glaze. The warmer the scones are, the thinner the glaze will be. They look delish… would Anne make them for me? ?